Pro-Style Warmer provides the newest way to have various toppings ready for your fun foods. It is simple, easy, and in five minutes you will be ready for the ultimate warm topping experience, whether it's butter for popcorn, cheese for nachos or chocolate or caramel for ice cream. Perfect for restaurants, concession areas, convenience stores, and at home. 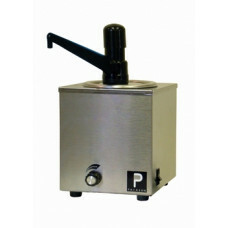 32 ounce Paragon condiment container. Attractive Stainless steel body and heat well. Adjustable thermostat, and 6’ cord and plug. Includes unheated spout domed pump easily dismantled for cleaning. 7”W x 7”D x 12.75”H.